Amazon.com Inc. has long used robots to help humans move merchandise around its warehouses. Now automation is transforming Amazon’s white-collar workforce, too. The people who command six-figure salaries to negotiate multimillion-dollar deals with major brands are being replaced by software that predicts what shoppers want and how much to charge for it. Machines are beating people at the critical inventory decisions that separate the winners and losers in retail. For the staffers deciding how many books, games or plastic pool toys to peddle, the tradeoff can be stark: Order too little and you miss out. Order too much and you’re forced into costly clearance sales. Amazon’s algorithms, refined through years of monitoring customer behavior, are getting the Seattle-based company out of the guessing game. It also appears that a winner has emerged in a long-running competition between the two teams most responsible for the company’s retail success. Former and current employees say the retail group that used industry connections to lure brands to Amazon and helped create an e-commerce colossus is now being merged with the team that runs the marketplace, an automated platform that lets anyone with an internet connection price, market and sell their wares on Amazon without interacting with a single person. In recent months, several high-ranking executives have left for other jobs or been reassigned, but few express much surprise that a company with a cloud services division and prowess in artificial intelligence would put machines to work wherever it makes sense. Amazon said it’s creating jobs and adding automation across the company to better serve customers. “We’ve been working for some time on standardizing the products, tools and services we offer to the brands and resellers that sell on Amazon, and have made some organizational changes as a result,” the web retailer said in a statement, adding that it has more than 16,000 corporate jobs open worldwide and created 130,000 jobs last year. Amazon began automating retail team jobs several years ago. Under an initiative called “hands off the wheel,” the company shifted tasks like forecasting demand, ordering inventory and negotiating prices to algorithms, people familiar with the matter say. At first, humans could easily override the machine’s decisions. For instance, if a brand notified Amazon about an upcoming marketing blitz for a product, an Amazon manager could increase the order in anticipation of demand the algorithm didn’t expect. But such tinkering was increasingly discouraged as the machines proved their precision, the people say. Anyone overriding the machines had to justify their decision, and the push to automate made them reluctant. “Amazon realized a lot of expensive employees were spending a lot of time working on things that should really be automated,” recalls Elaine Kwon, who worked as a vendor manager at Amazon from 2014 to 2016. This is a major shift from Amazon’s early days, when the company was pushing beyond books into electronics, toys and more. The upstart needed to persuade brands to sell their products on its website. So Amazon recruited graduates from top schools and veterans from traditional retailers who already had relationships with suppliers. Before long, major brands had overcome their initial reluctance to sell their wares on Amazon, and eventually the site carried millions of products. Meanwhile, Amazon was also developing a new way of doing business that required fewer middlemen and removed the risk of buying inventory. Launched in 2000, the marketplace took more than a decade to take off. But growth in Prime subscribers and Fulfillment By Amazon, which lets independent merchants use Amazon’s warehouse and distribution network, made the self-service platform a magnet for products without any help from its retail team. The center of gravity in retail shifted, and most major brands wanted to be seen on Amazon where so many people were shopping. A key turning point came in 2015 when the value of goods sold through the marketplace exceeded those sold by the retail team, the people say. The retail team, which had far more employees, watched its importance fade and money funneled into projects like Amazon Web Services and Alexa. It didn’t help that the marketplace generated twice the operating profit margin of the retail business—10 percent versus 5 percent, according to a person familiar with the company’s finances. In many international markets, the retail team has never turned a profit, the person says. In annual sales meetings, a team of 15 people overseeing a retail category would see their growth outperformed by one person from the marketplace team, the people say. The lines between the teams began blurring. Amazon retail vendors had once enjoyed such advantages as video and banner advertising and access to daily deals that get millions of hits a day; now marketplace merchants got the same perks. Many brands became more interested in selling on the marketplace, where they—not the Amazon retail team—controlled prices, images and product descriptions. About two years ago the retail team lost another key task: negotiating with major brands and manufacturers the terms of popular sales on the site called “Lightning Deals.” Common during the holidays as well as Mother’s Day and Father’s Day, they help move lots of inventory in a short period. Now, instead of calling their vendor manager at Amazon, the makers of handbags, smartphone accessories and other products simply logged into an Amazon portal that would determine if Amazon liked the deal being offered and the quantity it was willing to buy. No small talk. No give and take. Thousands of Amazon man hours spent forecasting demand, planning marketing strategies and negotiating deals was now handled by software, a major leap in efficiency. Inevitably, the creeping automation has made Amazon’s oldest business less interesting for the people who work there. 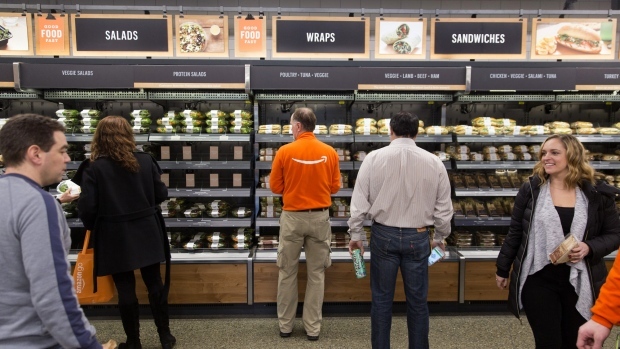 The team that created exciting new initiatives like the two-hour delivery service Prime Now and the cashierless AmazonGo convenience store now have fewer things to work on. There was a rare round of layoffs earlier this year and a retrenching of the grocery delivery service Amazon Fresh in November. Amazon’s most recent retail moves have been far more traditional than groundbreaking. The company acquired Whole Foods Market last year and partnered with Kohl’s Corp. to accept returns in its stores and Best Buy Co. to sell smart TVs. That helps explain the string of recent departures and reassignments that includes executives who’ve been with the company for years. The consolidation of the retail and marketplace teams accelerated earlier this year after Sebastian Gunningham, a senior executive who ran the marketplace and played a key role in Amazon’s artificial intelligence initiatives, departed for a new job at WeWork, creating an opportunity to reorganize. Some former retail team members are finding work or consulting gigs with manufacturers and brands hungry for people who can help their products stand out on Amazon’s cluttered site. Kwon, the former vendor manager, started her own e-commerce management and software company. Kwontified helps fashion and beauty merchants sell on major platforms, including that of her former employer.